B.A / B.Sc. / B.Com./ M.Sc. Migration Certificate (in the case of a student who has passed from any University other than M.G. University) must be produced within one month after enrollment. Applicants are advised to keep with them true copies of their certificates before they surrender the original certificates to the college office. Students from backward communities should produce their community and income certificates from the Tahsildar concerned, at the time of admission, in order to get the benefit of fee concessions and other financial aid from the government. Tuition fee is payable in one instalment. If admission is secured the applicant should get herself enrolled forth with by paying the fees. 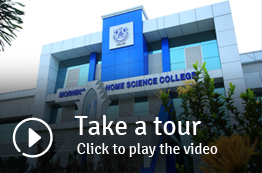 At the time of admission, every student shall pay, all instalments of fee due, till the date of admission. Every student is liable to pay the fee for the whole term during any part of which her name has been on the rolls. The following special fees shall be paid. Students belonging to SC/ST/OEC are exempted from paying caution deposit. At the end of the particular course of study, caution deposit (library and laboratory) will be refunded to them after adjusting the dues, if any, on account of loss of library book, breakage of laboratory equipment or any other loss caused to the properties of the college. Every student should collect the refund of her caution deposit after completion of the course. Caution deposit will be forfeited if it remains unclaimed within two months of completion of the course (last date of Unversity exam). The students should keep in safe custody the receipts issued for remittance of the caution deposit amount during the tenure of the course. 1. Fees once paid will on no account be refunded. 2. A student joining at any part of a term will have to pay fees for the full term. 3. A student leaving at any part of a term is liable to pay fees for the full term. Tuition fees will be collected in whole. Tuition fee including the special fees prescribed and caution deposit will be collected on the date of admission. If any student fails to pay the Tuition fee or special fee on the due date she shall be liable to pay a fine of Rs. 5/- along with the fee or special fee on or before the 7th working day after the due date. If the 10th day happens to be a holiday the next working day will be counted as the 10th day. If the Tuition fee with a fine of Rs. 5/- is not paid on or before the last date fixed for payment with a fine of Rs. 5/- an additional fine of Rs. 10/- will have to be paid. If the fee and fines of an instalment are not paid before last opportunity given for payment of the instalment, the name of the student will be removed from the rolls of the college with effect from the date following expiry of this period and the student will not get the benefit of attendance from the date of removal from the rolls of the college. If the student is to be re-admitted she has to apply for special permission of the Principal and also has to remit all the arrears of fees with fine and Rs. 50/- as readmission fee. The re-admitted student will get the benefit of attendance only from the date of re-admission. The names of defaulters of an instalment will be published in the notice board immediately after expiry date of the last opportunity fixed for payment of fee. Students who are admitted for a term for making up shortage of attendance for the course which the student was undergoing, should pay one third of the tuition fees for the year along with special fees and caution deposit in one instalment, at the time of admission. Only such category of former students of the college will be admitted as term students. Every student is liable to pay the prescribed fee for the whole term during any part of which her name is on the rolls of the college. If a student is admitted to the same course of study in any other similar college, after obtaining transfer certificate from the institution, she shall not be required to pay the fees already paid for the term in the college which issued the TC, but special fees and caution deposit will have to be paid again in the new college. Students belonging to Scheduled Caste and Scheduled Tribe who are bonafide subjects of Kerala State are eligible for full fee concession and stipend. Fee shall be paid on the date fixed in the college calendar. Absence with or without leave from the college shall not be an excuse for non-payment of fees on the prescribed date. A receipt signed by the accountant shall be given for every payment made, which the students shall preserve and produce whenever required by the Principal. Mistakes, if any, in the receipts issued for payment made should be corrected on the spot. All cash transactions will be closed in the office at 2p.m. everyday. The working day is divided into two sessions: forenoon session of three hours and afternoon session of two hours. Attendance will be marked at the beginning of each hour by the teacher in charge of the class. Students shall occupy their respective seats before attendance is taken. Late comers should neither enter the class room, norshould any student leave the classroom, without permission of the teacher in charge of the class. Late comers may be given or refused attendance for the period or marked late, at the discretion of the teacher concerned. Those students going for sports, games, official purpose of union activities etc.should apply for prior permission from the Principal in the prescribed form, countersigned by the Head of the Department, in order to be eligible for leave. Non-compliance will be considered as absence from class. For the purpose of attendance all working days, irrespective of the number of working periods, shall be considered full working days. POST-GRADUATE COURSES: Postgraduate Courses have been functioning semester system from 2001 admission onwards. As part of the restructured curriculum, there will be internal assessment for these courses. 25% of the total marks will be internal evaluation for all post-Graduate courses. These rules are liable to be amended as per the M.G. University orders. GRACE MARKS: The Mahatma Gandhi University Syndicate has decided to implement the revised norms for award of grace marks to students who participate in sports and arts (University Youth Festival), National Service Scheme (NSS), National Cadet Corps (NCC) etc. as per order No. Ac. A1/1/2661/2003 dt. 31/12/2003. The annual Certificate of Attendance and Progress required by the University for promotion or for admission to the University Examination will in no case be granted unless (1) a student has attended at least 75% of the working days for her course during the academic year, and (2) the Principal is satisfied that the student's progress and conduct have been satisfactory. No student shall absent herself from class without leave. Application for leave should be made to the Principal, in the prescribed form not later than the first day of return to the college after the absence. Every application for leave shall be countersigned by the Parent or Guardian as the case may be. Incomplete application will be rejected. When leave is required in case of illness for more than three consecutive working days application for the same must be supported by a Medical Certificate. If absent without leave for one class hour a student will lose attendance for the whole session. When the total days of absence in the academic year exceed ten, the parent/guardian of the student shall meet the Principal and give a satisfactory explanation. A student absenting herself without leave for more than ten consecutive working days will have her name removed from the roll, and she may be re-admitted only on payment of the admission fee and dues of college fee, if any. Absence without leave request from any internal evaluation examination or from a practical work will be seriously dealt with. Students should get 75% of attendance a year and if they fall short the deficiency will be condoned only when the University Syndicate is satisfied that the absence was for reasons beyond the control of the student. Deficiency beyond 20 days will on no account be condoned and exemption will not be granted for more than one academic year in any course of study. A student who has paid all dues to the college is entitled to Transfer Certificate (TC) at the completition of the course. A student past or present, desiring to obtain a certificate (Transfer, Course & Conduct, Age, Marks, Identification etc.) shall apply to the Principal in writing, stating the years of study and the class number. Application for T.C. shall ordinarily be countersigned by the parent or the approved guardian. Every such application shall be submitted along with search fee of Rs. 10/- for students on the rolls and Rs. 20/- for others. For all such payments a rceipt shall be obtained from the accountant. Ordinarily a notice of 24 hours is necessary for the issue of a certificate. Conduct certificate will be issued only 48 hours after application. No certificate will be sent by post unless the whole transmission charge is prepaid in cash or in postage stamps. In case a student is expelled from the college for serious misconduct or repeated misbehavior, her T.C. will be sent to the Registrar of the University and the matter will be reported to her parent or guardian. Every student should collect her T.C. at the end of her course and produce it when admitted to the next course. T.C. will be issued only against the surrender of identity card. Conduct Certificate is a document which a student has to earn. It is not issued as a matter of course. Conduct Certificate is issued on the basis of an over all evaluation by the teachers concerned. Principal is the ultimate disciplinary authority in the college. In the interest of the institution and for the sake of discipline, the Principal is entitled to refuse admission to any applicant, to suspend, dismiss or take any other punitive action on any student for her misconduct. a) Staying away from classes without sufficient reason. b) Disrespectful behaviour towards the staff. c) Provoking students to strike classes and participating in strike in the college. d) Loitering in the verandas during free hours and creating disturbance to the classes in progress. (During free hours the students are expected to make use of the Library). e) Disorderly behaviour in the class. f) Organizing meetings in the college or displaying notices on the College notice board without the permission of the Principal. g) Taking outsiders into the college campus. h) Distributing leaflets, hand-bills or other printed materials and displaying banners and posters inside the campus. i) Scribbling offensive, abusive or obscene words or figures on black boards or any kind of writings on the walls or other places in the college. These rules are liable to be amended when found necessary. Rules of modesty and decorum in dress should be strictly adhered to. A simple chain, a pair of ear rings and a wrist watch may be worn. The students shall wear uniforms according to the directions given by the college authorities. Uniforms are compulsory on exam days. Use of mobile phones and ragging are strictly prohibited in this institution as per G.O. Rt. No. 346/05 dated 01-3-05 and Kerala Ragging Prohibition Act 1998 respectively. Ragging, even of any simple nature, is punishable. Students are expected to possess their college ID Card in the campus and to produce the same whenever and wherever asked by the authorities. No political / organisational activities shall be permitted in the campus. Mobile phones are strictly banned in the college campus. In the event of any violation of the above rules, the Principal or the teachers are authorised to seize the phone and to impose appropriate punishments.